Formula 1 is an American based company that manufactures auto care products for all types of cars whether hatchbacks or salons. It was established in 1958 under the name Kit Car Wax and became the number 1 car wax in the United States due to its ability to make Carnauba Wax, the world’s hardest wax, easy to apply and peel off for perfect paint finishes. The company was eventually renamed to Formula 1 and the product lines have expanded steadily over the past 60 years. Today, Formula 1 offers a huge collection of auto care products that are craved by motoring enthusiasts all over the world. 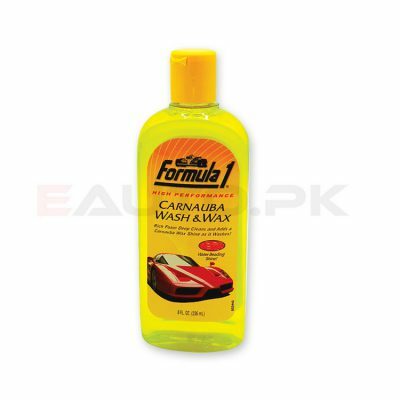 We offer you the opportunity to buy the top quality Formula 1 auto care products online at EAUTO.pk without any hassle. The Formula 1 auto care products cater to all parts of your car whether it is the interior, exterior, upholstery, wheels or windscreen. Shine and protect your auto paint finishes with Formula 1 Liquid Wax or Carnauba Fast Wax that both form a protective shiny coating over the paint finish swiftly. You can even opt for color waxes with silver, black and red colors or clean your car with Formula 1 Carnauba Wash and Wax that will leave your car exterior spotless and gleaming. Get rid of pesky stains on the windscreen with Formula 1 Windshield Wash Concentrate that removes marks and stains more effectively than any of its competitors. Repair and restore your exterior surfaces with Formula 1 Complete Compound, Scratch Out ® Liquid and Headlight Restorer and Sealant. Make your car shine with Formula 1 Metallic Car Polish or Shine It All, which provide advanced polymer shine and protection to the exterior surface. All of these Formula 1 auto care products and more are available and easily accessible through EAUTO where you can browse online for Formula 1 auto care products at the most affordable prices in Pakistan. So hurry now and order your desired product from our website and avail our home delivery services.